When it comes to election year trade politics in the US, nothing is easier than to complain about China, an economy sustained by a web of subsidies across a wide range of industries. China has long wanted to become a world leader in car and car part exports and has been offering tax and other incentives for years – including cheap credit and land – to domestic auto and auto parts companies. So why complain now? Beijing has been quick to blame the move announced this week by Washington on the race for the White House. “In the midst of an election race, the United States chose to announce this news in Ohio, an automobile production area, showing that the US took this step against China out of considerations of electoral politics,” the ministry of commerce said on its website. The US case hinges on so-called “export bases” for car and car parts, which Washington says hurt US manufacturers and force them to shift production overseas. The Obama administration says these bases violate the prohibition on “export contingent subsidies” that China signed up to when it joined the World Trade Organisation. “Based on publicly available documents, export bases made at least $1bn in subsidies available to auto and auto-parts exporters in China between 2009-2011,” according to the office of the US Trade Representative. The export bases are located in 12 cities around China and serve to gather firms ranging from manufacturers to trading companies to training and financial institutions with the aim of facilitating automotive exports. In Shanghai, for example, Anting Shanghai International Automotive City offers preferrential policies on rent and other subsidies. Individual companies are not subsidised, but local governments subsidise spending on services, such as holding exhibitions. The USTR says these bases “use central and local government funds to provide a variety of export-contingent subsidies to auto and auto parts exporters such as grants, tax preferences and interest rate subsidies”. Auto market analysts in China say that is all true – and has been for several years. China’s car exports have risen sharply in recent years, by 50 per cent in 2011 to 850,000 cars, and exports this year are expected to hit 1m. But only 2,252 of those cars went to the US last year: most went to emerging markets. The jump in exports to those markets “has everything to do with weakening performance at home”, says Mike Dunne, of Dunne & Co, an Asian auto consultancy. Chinese automakers had been losing market share to European and American carmakers for the past few years, so to reach their production targets they had put new emphasis on exports. There are reports that a flotilla of about 1,000 Chinese fishing boats is headed for the disputed islands at the heart of the dispute between China and Japan. A move toward the islands – known as Senkaku in Japan and Diaoyu in China – raise the question of whether Japan’s coast guard or navy would confront the ships. A dispute over a quintet of uninhabited islands is jeopardizing the political and trade relationship between the world’s second and third-largest economies, as a number of Japan’s flagship companies announced temporary closures of their China operations on Monday after being targeted by days of angry protests. Automakers Nissan Motor Co., Honda Motor Co. and Mazda Motor Corp. – who collectively employ thousands of Chinese workers – each announced they were temporarily suspending production in China after a week of anti-Japanese protests around the country that saw Japanese-owned businesses looted and Japanese cars and restaurants attacked. Other industries, including electronics, food and retail, were also affected and the dispute put global supply chains for Japanese products produced in China under threat. Protests are expected to crest Tuesday, the anniversary of the 1931 Mukden Incident, a staged attack on a Japanese railroad that was used to justify the Japanese Imperial Army’s invasion and occupation of Manchuria at the outset of the Second World War. There were also reports that a flotilla of some 1,000 Chinese fishing boats was headed towards the disputed islands – which are known as Senkaku in Japan and Diaoyu in China – raising the question of whether Japan’s coast guard and navy would try to confront the ships. Any kind of trade war – let alone a broader conflict – would be devastating. Commerce between the two Asian giants amounted to $345-billion (U.S.) last year, with many of Japan’s globally known brands, including electronics firms, outsourcing much of their production to China. Already, there have been calls in China for a nationwide boycott of Japanese products. China is Japan’s largest trading partner, while Japan is China’s No. 2 partner after the United States and a major source of direct investment in the Chinese economy. Joseph Caron, Canada’s former ambassador to both Japan and China, said the situation will require delicate diplomacy from both sides to avoid escalation of the dispute. A heightened conflict would have implications for the global economy as Asia’s manufacturing and supply chains are deeply integrated. “It’s important not to demonize one side or the other in all this. There is obviously going to be a painful but hopefully non-militarized adjustment to the fact that China’s power is increasing,” Mr. Caron said in an interview. “It is not only China that has legitimate interest in these waters and in the region. Neither country can afford a prolonged break in the trading relationship. The Japanese economy grew just 1.4 per cent in the second quarter of 2012, while China posted 7.6-per-cent growth in the same period, its slowest pace in three years. “The reality is that while these adjustments are struggling to emerge, in so many other areas, levels of mutual dependence have never been higher,” Mr. Caron said. Japanese car manufacturers count China as a major market and a driver of future growth. Toyota, Nissan and Honda saw 11 per cent, 17 per cent and 20 per cent of their respective 2011 unit sales from China, according to Bill Russo, China auto analyst at Synergistics. Mr. Caron said targeted economic sanctions or large-scale boycotts imposed by both China and Japan are a distinct possibility if the dispute is not quickly resolved. “It’s worrisome. Our economic security depends so much on the success of those economies. So everyone is going to watch this very closely,” he said. Julian Dierkes, a professor at the Institute for Asian Research at the University of British Columbia, said he was optimistic that the deep economic ties between the two countries would keep the dispute from getting out of hand. “The economic implications are huge but that is also the safeguard. ... It must be very clear to [Chinese] businesses and industry that there is no way to decouple from Japanese industry. Those inter-linkages are so clear and obvious,” Mr. Dierkes said. Some of the protesters in Beijing admitted they weren’t sure how they could live without their Japanese electronics, fashions and snacks. “Japan is bullying China and I hope Japan does not take Chinese tolerance for granted,” said Zhang Liguo, a 17-year-old student who joined the protests at the Japanese embassy. The temporary closure of Japanese manufacturing facilities and other businesses came as the United States announced a new trade action against China. Speaking in Ohio, a hub of American auto parts manufacturing, president Barack Obama accused China of illegally providing $1-billion worth of subsidies to its auto parts industry. “These are subsidies that directly harm working men and women on the assembly line in Ohio and Michigan and across the Midwest... . It's not right, it's against the rules and we will not let it stand,” Mr. Obama said. There likely won't be any quick resolution in the dispute between China and Japan for control of an obscure group of islands. But there's already one clear loser: the Japanese car industry. Thousands of Chinese protesters marching on the Japanese Embassy in Beijing over the weekend, burning flags and smashing cars, signals the strength of anti-Japanese feeling among young Chinese. The proximate cause is a dispute over control of the Senkaku Islands, controlled by Japan and claimed by China, which call them the Diaoyu Islands. Lingering anger at Japan's 1930s invasion of China, and rivalry between Asian powers, runs deeper. In the immediate future, it's bad news for Japanese car manufacturers, who already count China as a major market and a driver of future growth. Toyota, Nissan and Honda saw 11%, 17% and 20% of their 2011 unit sales from China, according to Bill Russo, China auto analyst at Synergistics. The China Association of Automobile Manufacturers has said the downturn in sales of Japanese cars is already evident in the August data. Nissan has acknowledged that the row is hurting sales, and Honda dealers have canceled some promotional activities. There could also be longer-term consequences. The sight of Japanese cars smashed by angry mobs won't encourage dealers to place bumper orders for next season's models. 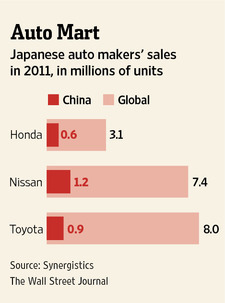 Japan's auto firms still have many factors in their favor, though. Many of their Chinese sales are made in joint ventures with mainland firms—a confusing factor for angry mobs and government officials considering trade sanctions. A reputation for reliability at an affordable price is another plus. A similar wave of protests in 2005 had little effect on the upward trajectory of sales. Japan's auto makers will hope that the latest wave of nationalist sentiment doesn't have a more lasting impact. The MUV segment in India is currently at 16% of the total car market. But it is set to grow rapidly. In Indonesia, MPVs comprise 30% plus of the market. In China too, this segment is growing rapidly. "Their popularity seems to coincide with a changing consumer profile. Second-time Chinese buyers use their vehicles for multiple purposes like travel, family activities where MPVs serve well," says Bill Russo, president, Synergistics Ltd, a China-based consulting firm with focus on the auto sector. India will surely follow China in the preference for MPVs. Maruti was the first one to realise its true potential and launch a product to cater to this segment.